Ogaden National Liberation Front or ONLF, a movement that fights the return of the Independence of Ogaden region, Southeast of Ethiopia near Somalia launched an attack on a military base in the remote Ogaden city of Dagah Madow in the Jarar Province, Saturday, June 13, 2015, according to residents and ONLF portal. 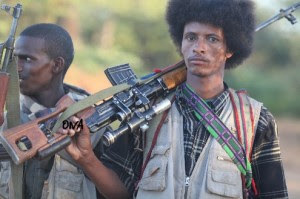 Saturday’s attack came three days after the Ethiopian Security forces and Fighters from Ogaden National Liberation Army (ONLA), the Group’s army wing clashed in Dabajiriso town in the district of Birqod in the Jarar region, one of five repeatedly targeted by ONLF fighters. The site did not report any casualties of ONLF fighters in the Saturday’s violence. Ethiopian officials said that the Security Forces successfully repelled ONLF attack on government bases throughout the night of June 13. Ethiopian authorities have sealed off the region to international journalists. It also expelled the international agencies such as Red Cross and Doctors without borders and denied their return to the region for fear of reporting the higher level of the actual army insurrections that occur in the region on daily basis. Meanwhile, Fighters from “Dufaan” unit which translates to storm killed eight Ethiopian security forces and wounded nine others, according to residents that was forced to bury rotting corpses at Guna’gado district of Degahbur Province last week. Citing an ONLF HQ’s source, the site reported that the rebels have inflicted heavy casualties on Ethiopian soldiers and had seized heavy military equipment, apparently during a recent attack by the ONLF on Ogaden region’s southwestern town of Fiqi Harun. We could not independently verify the ONLF’ claims and the Regional President Abdi Mohamoud Omar could not reached Saturday for comment about the rebels claims. Ethiopia released two ONLF officials,who were abducted by Ethiopian Security Forces from Nairobi on January 26, 2014 when they were paving the way for intended talks between Ethiopia and the ONLF’s political wing. The Hardened rebels, who armed with light ammunition such as sniper rifle, AK47,PKM,Dshka, etc has been fighting to create an independent state in Ethiopia’s Ogaden region after the British handed over their territory to Ethiopia in 1954. Hundreds of thousands of people are believed to have been killed since the Ogaden National Liberation Front (ONLF) waged the army struggle against the Ethiopia in 1994.